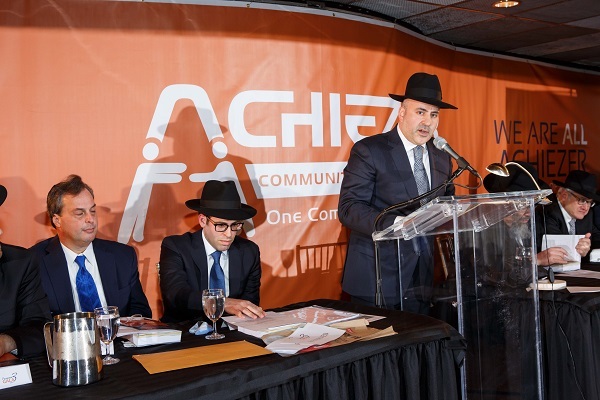 This past Sunday evening, Achiezer, who tirelessly works to assist our entire community, hosted its third annual Gala, which was attended by more than 1,300 enthusiastic participants. 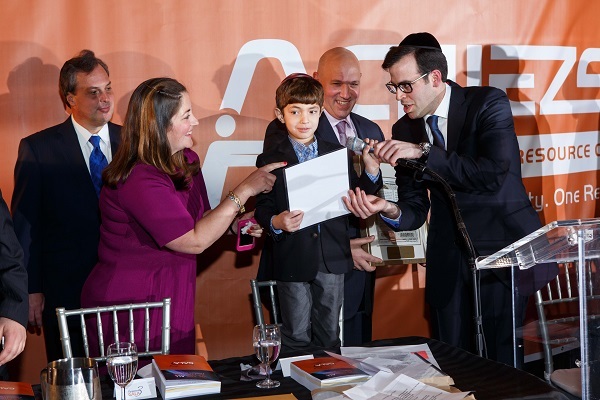 Those present included dozens of rabbonim and nearly a dozen elected officials--showcasing the feeling of camaraderie and unity which has become synonymous with Achiezer. The evening was laced with a feeling of achdus and of purpose; the Gala's tagline "We are ALL Achiezer" was truly felt. So many of the attendees have been recipients of Achiezer's many programs -- they were there both to show their appreciation and to express their desire to be a part of such a wonderful organization; where one can be both a contributor and a beneficiary at once. The Gala took place at the Sands Atlantic Beach and the evening began with a delectable buffet dinner catered by Chap a Nosh and a Sushi Bar by Simply Sushi. By 8:15pm, the program had already commenced with an overflowing crowd. 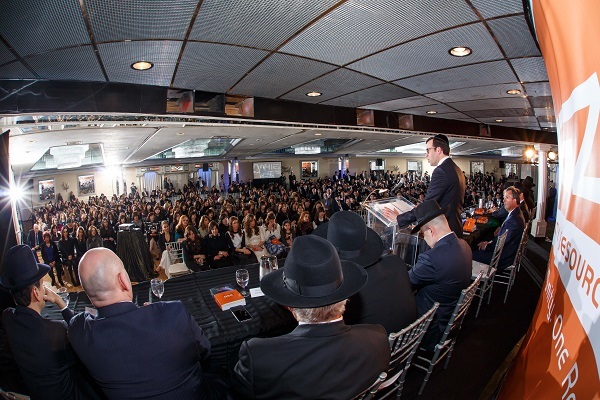 Master of Ceremonies, Mr. Adam Mirzoeff began the program welcoming and thanking the many Rabbanim, community leaders and dignitaries in attendance. 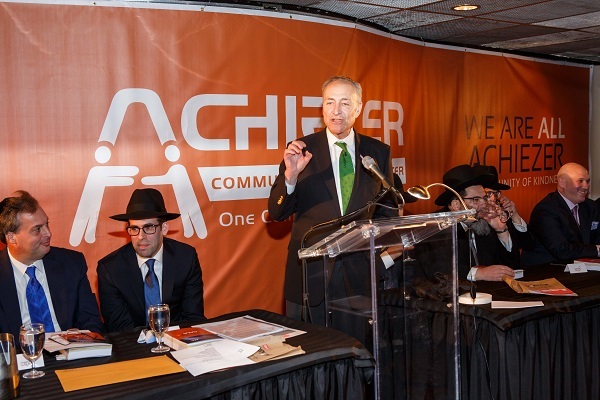 Senator Chuck Schumer spoke eloquently about his great connection to the Bender family, stemming all the way back to his involvement together with Rabbi Yaakov Bender (father of Achiezer's founder and director, Rabbi Boruch Ber Bender) in the inception of Flatbush Hatzalah many years ago. 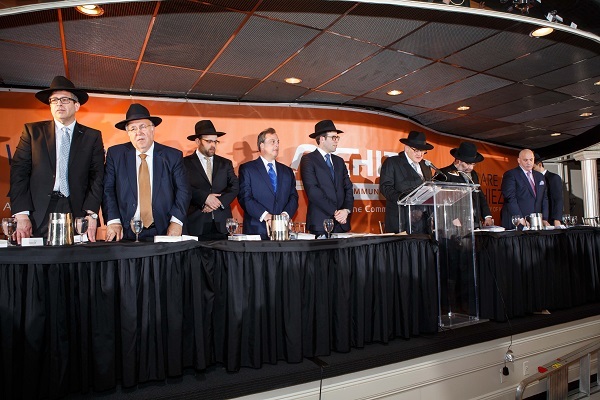 He also spoke about Prime Minister Netanyahu's speech to the Assembly and promised that he will "do anything he can here in America and in Eretz Yisrael to keep Am Yisrael Chai." His statements were met with a standing ovation. Mr. Mirzoeff also gave honor and tribute to the late Mayor of Cedarhurst, Mr. Andrew Parise, who served our community with devotion and commitment, as well as Joseph Sanford Jr. a young fireman who recently died in the line of duty. He also thanked our local Police and Fire Department representatives are were in attendance, and on behalf of them all they received a rousing standing ovation. All assembled then recited a perek of tehillim, led by Trustee Mr. Ronald Lowinger. Thereafter, Chairman of the Board, Mr. Shulie Wollman, addressed the crowd. He thanked everyone for showing their support of Achiezer, their belief in Achiezer, and that they are all a part of Achiezer. In Adam's articulate words, "Achiezer holds your hand through the expertise process, to cope with the challenges you are dealt" and tonight, Achiezer was held aloft by the community, allowing it to continue its sacred work. Rabbi Boruch Ber Bender's address began with a touching story related by Rabbi Yisrael Meir Lau, Chief Rabbi of Tel Aviv. Through the story, Rabbi Lau, a noted Holocaust survivor, explained that, despite all of the horrors he experienced, the one thing that moves him most, that brings him to tears is "unnatural giving". The act of chesed, not because it is convenient for the giver; but because he wants to give to another person, to do for him, to ease his pain. Rabbi Bender then explained that "this is why we are all here tonight; every person here wants to give in some way." He continued, "the calls are difficult, the volume is high, the needs are pressing," and with candor he went on that it is Achiezer's responsibility to keep up with the calls, responding to each and every one. He thanked each employee by name for their contributions to the organization; for without their seamless work and compassion the organization could not function. He also he thanked the many people who are ALL Achiezer -- the financial advisors who guide a family with an over-drafted account to a regularly paying job, to stability and to dignity; the doctor who has just arrived home after a 14 hour work day and turns right back around to the hospital to attend to an "Achiezer patient." Rabbi Bender then related a chilling story about Danielle Besser A"H, who was tragically killed in a terrible motor vehicle accident while vacationing in Mexico. Achiezer, together with Homeland Security's Dov Horowitz and Lilian Fergie Hernandez's relentless efforts, came through with something that one Mexican Official stated was "never seen before." They were instrumental in bringing her body back to a proper and timely kevuras yisrael. 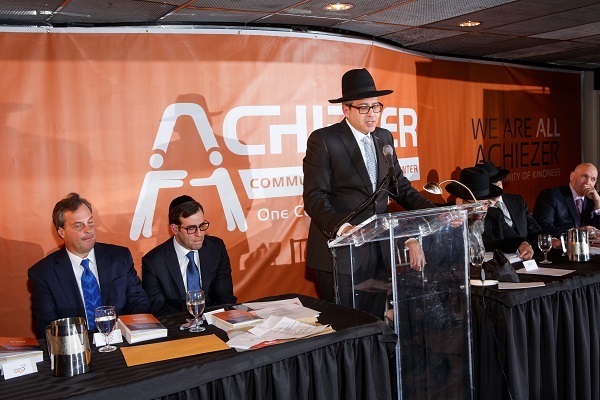 Rabbi Bender concluded with an indelible message - that the commitment and resolve of the community, the volunteers, the staff, the supporters and the friends of Achiezer stands strong, for they are the incredible make up of Achiezer. He further gave the assembled a bracha to continue in the path of unnatural giving. The program continued with video presentations and awards presented to each of the five distinguished honorees. When Dr. Schneider accepted his award, he was surprised with a very young visitor--one who owes his life to Dr. Schneider. 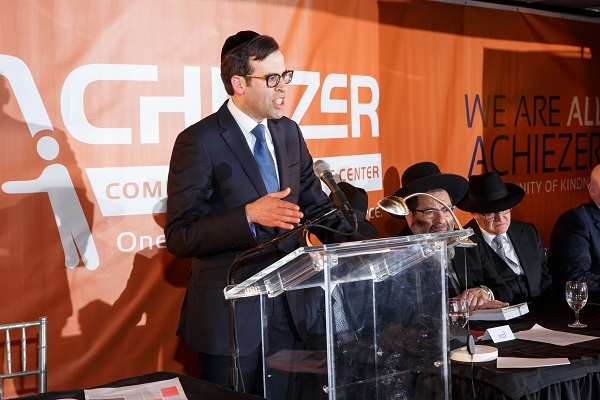 When the Kohn Family from Cedarhurst heard that Achiezer was honoring Dr. Schneider, they reached out to Rabbi Bender. Five years ago, their 15 day old son wasn't "acting right". Young Benny Kohn was eventually admitted to the hospital, where an "angel", in the form of Dr. Schneider appeared. He performed a brain procedure which proved to be lifesaving; and the Kohn's felt it was only appropriate to present Dr. Schneider with a note, written by Benny himself, thanking him for his vitality. Needless to say there wasn't a dry eye in the room. The last speaker of the evening was the Guest of Honor, Mr. Yoeli Steinberg. He noted how this week's Parsha, Vayakhel, contains G-d's commandment to erect the Mishkan. Yoeli likened Achiezer to a place where Mishkans are constantly being erected, where families are made whole, where Hashem rests. He explained that he accepted the award merely as a representative of the community. He thanked those in attendance for "being Achiezer." As the program came to an end, there was one last video presentation--a display of what goes on at Achiezer on any given day. There were no words necessary to portray Achiezer's wide range of services, from cancer treatments, death/bereavement, hospital meals, health insurance or mental health counseling, the film spoke for itself. Achiezer's 3rd Annual Gala drew to a close with a beautiful dessert buffet. As the crowd lingered for just a bit more, the conversations all centered on the program, Achiezer, and its great accomplishments in but a few years. The feeling was warmth, it was appreciation for the past, it was inspiration for the future; it was a feeling of Achiezer.